When it comes to choosing which aspect of the iGaming world an online casino should focus on, there are certainly worse choices than jackpots. Every online casino player has dreams of landing the right combination on the right game at the right time and making themselves a millionaire, and Dream Jackpot is a site that is aimed directly at those players. A good target audience, certainly, but does Dream jackpot have what it takes to appeal to prospective customers, or is it simply a waste of a good name? That is, of course, if that content and customer service is enough to be competitive, which is no easy task given how busy the online casino market is, and the huge number of rival sites that exist. In short, Dream Jackpot has a great deal to do here, but is this relatively new online casino capable of doing it? If you are looking for a sign that Dream Jackpot brings a fresh and unique approach to the world of online casino play, then you are certainly not going to find it within the design concept here, which is so dated that it would’ve been turned down by online casinos at the very beginning of the industry some 20 plus years ago. The banner across the top of the homepage that scrolls between images of decadence such as sports cars, champagne bottles and yachts, and chips and other predictable casino based images gives you a sense of the lack of effort here. There is a third image in the banner that uses images from a popular game of the time, but at the moment of writing, that game is EmojiPlanet, and the design used is horrible. 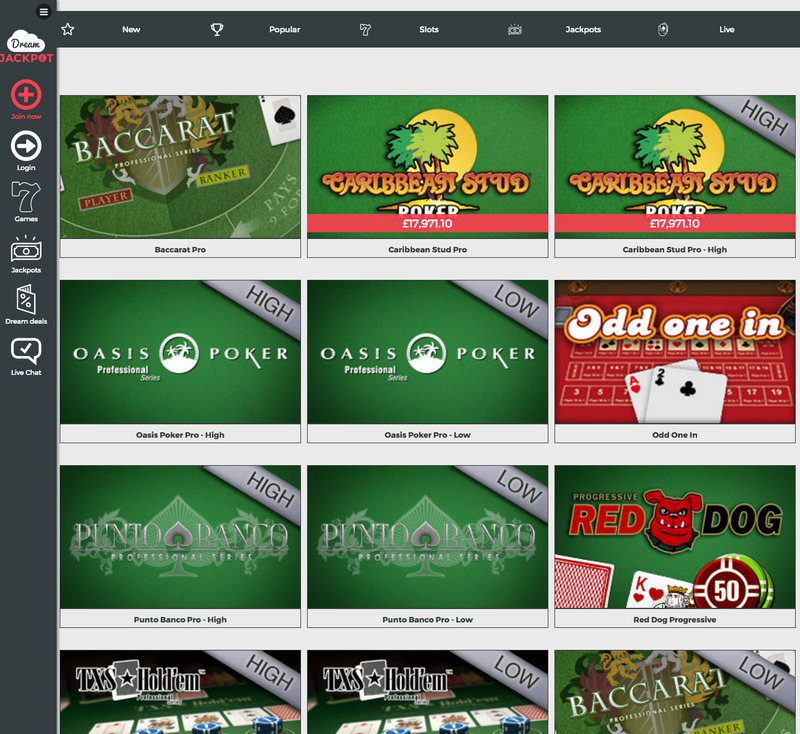 Navigation is incredibly simple here, with games separated into numerous categories, and promotions and live chat options easy to find, and that’s great, if only the rest of the Dream Jackpot site came close to being as good. With a design that looks like it was created by someone who has never played at an online casino, and has simply guessed what one may look like, Dream Jackpot is not catching anybody’s eye. 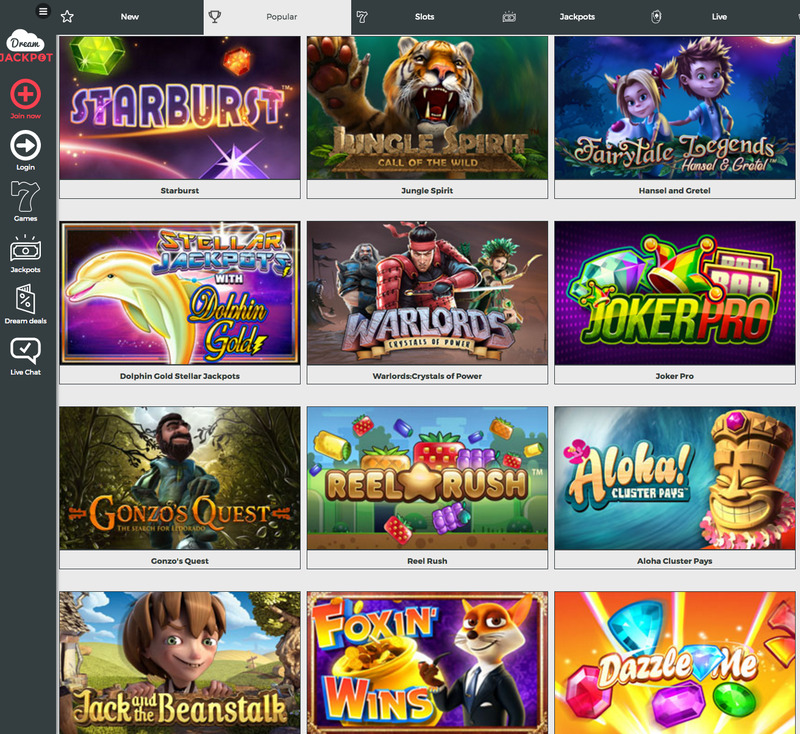 When you look at the wide range of top quality games that are available at Dream Jackpots, it is almost impossible to connect it with the atrocious design theme it’s packaged in. With titles from 1X2 Network, Aristocrat Gaming, Blueprint Gaming, edict egaming, ELK Studios, Evolution, Ezugi, Leander Games, Microgaming, NetEnt, Novomatic, NYX Gaming, Quickspin, Stars Group, Thunderkick, and White Hat Gaming, there is a huge variety on offer here, with something to satisfy every possible taste. Jackpots are, unsurprisingly, the focus here, and there’s a counter on the homepage which keeps you up to date with the total jackpot available at the site at any time. There are numerous jackpot slots available, and they all have the current jackpot clearly marked so you can pick the one that feels right to you at any given time for a chance at a jackpot win. You’ll also find a myriad of other slot games, as well as a strong collection of table and card games as well, meaning that you are unlikely to ever get bored of the games on offer here. Dream Jackpots is a truly excellent site in terms of content, all it needs is a total overhaul of design, and it’ll be close to perfect!